If you are new to my blog you may want to subscribe to the CoffeeMuffins RSS Feed or follow me on twitter. Enjoy! Slow Cookers are under-rated and I use mine less often than I should, however I have learnt that when it comes to cooking a meal for a large number of people nothing beats them. On New Years Eve I got up at 9 o’clock in the morning, and put my lime sorbet in the freezer and started preparing my main. By 9.30 am the main meat part of my meal needed no further preparation from me (well not until half an hour before serving). This gave me plenty of time to make all the delicious additions to my Mexican themed evening. I am pleased to say that I made this entirely from scratch, I throughly enjoyed it and so did my guests even the usually most critical ones! 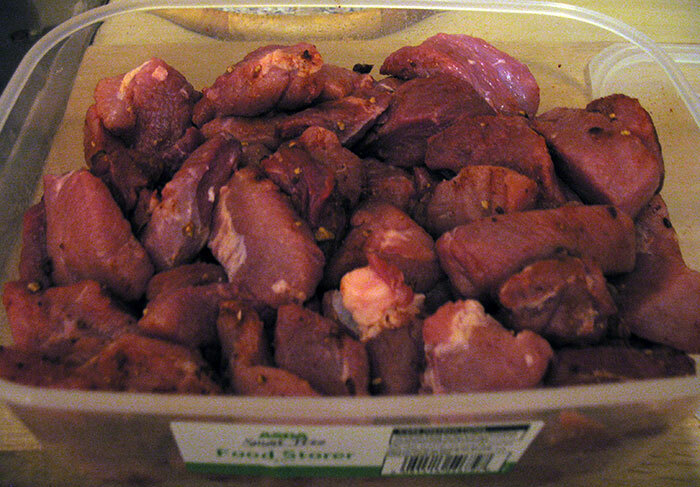 Preparation Time: 15 mins, plus time for marinade. First cut the pork into cubes. Then add all the ingredients for the marinade in a small bowl and mix. Add the marinade to the pork, use as much or as little as you like, ensuring each piece is coated evenly. Leave in the fridge overnight. 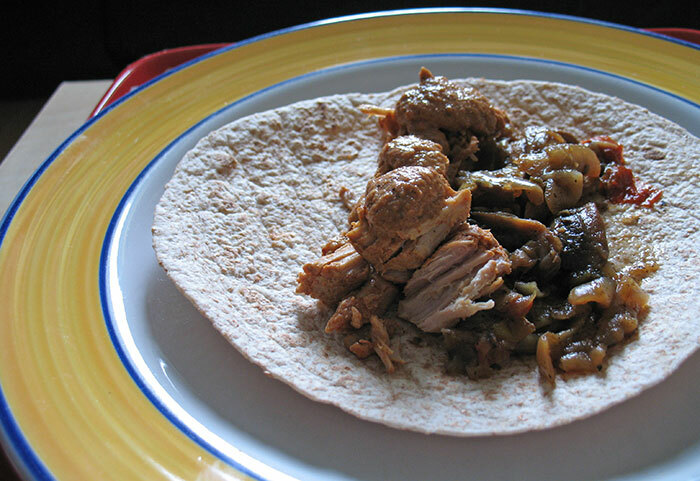 In the morning take the pork out of the fridge and turn the slow cooker on high to start warming it. 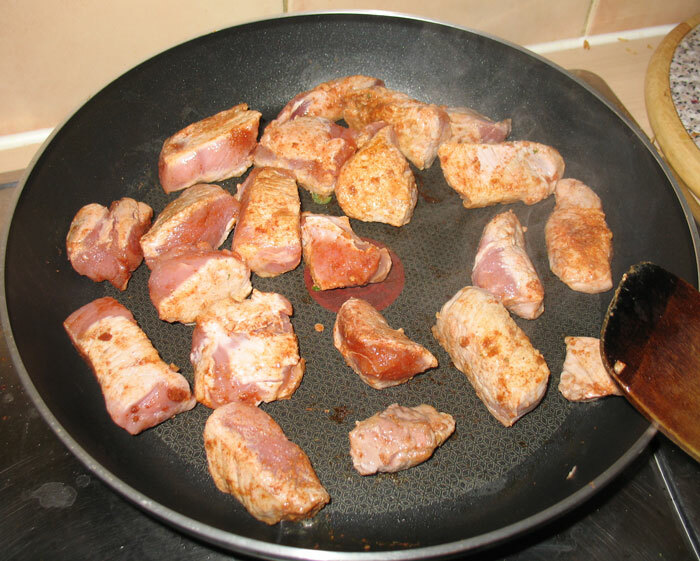 In batches brown the pork in a frying pan – you don’t need to use oil. Once each batch is browned add to the slow cooker. Once all the pork is browned add 2 cups of water and the tomato puree to the frying pan, gently remove the tiny bits of pork and seasoning that have stuck to the pan into the water. Once the water is starting to boil, carefully pour into the slow-cooker. Place the lid on and leave for 8 hours. Remember every time you remove the lid you need to check the pork you should add around 30 minutes onto the cooking time. (I checked mine twice during the 8 hours). 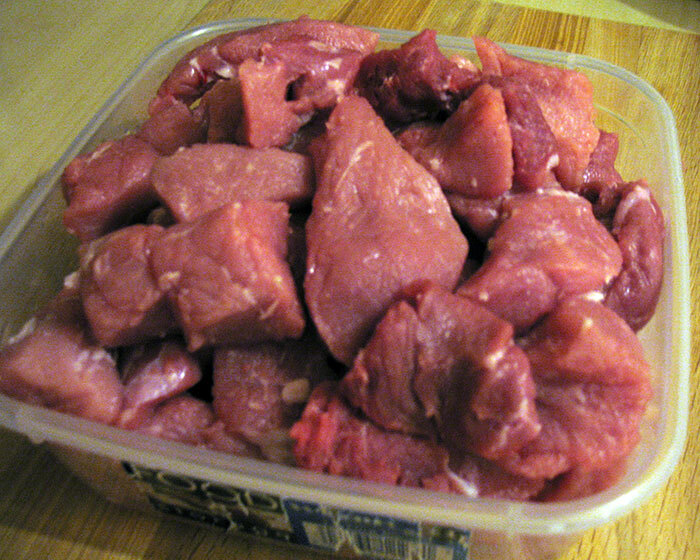 Once the pork has been cooked for the full time, remove the pork chunks using a slotted spoon into a container, using two forks to gently pull each chunk apart. Next remove the liquid, there should be quite a lot of it, into a pan and allow to reduce. Turn the slow-cooker down to low, and add the pulled pork back in. One the liquid is reduced by more than half, and it back to the pork. You can now leave it in the slow-cooker till you are ready to serve. As mains go for a dinner party this is about as little work as you can possibly achieve. Alongside it I made a batch of vegetables (around 8 onions, 8 peppers of mixed colours and mushrooms) all dry fried with a little fajita seasoning) and an almond mole sauce (recipe to follow). I had a wonderful time making this meal for my friends, so my first New Years Resolution is to have more dinner parties.